Just because the Fox has been quirt dose not mean he hasn’t been busy. It has indeed been a long time since I last blogged on hear. So much has happened in the last year I wouldn’t know where to start, instead I’m going to focus on moving forward. I make no promises about the frequency of my posts but I do intend to start using this site a lot more. With the obligatory apology for not blogging out the way what have I dun most recently worth talking about? That was the working title of the project I recently completed. I eventually settled with the name “Burning Rain” (still not happy with the name). This was a idea that took a few mouths to bring to fruition. The idea stemmed from 2 things. The first was I have been doing more work promoting Japanese culture this coursed me to do some heavy research in to Kimonos. With a few now in my position I wanted to do a shoot involving them.The second part came from seeing a photo wire wool being spun and the sparks bouncing off. There are many artists who have dun this. It stuck me in all the examples I was able to find the model isn’t very visible. With the two ideas rattling round my head I remembered a friend of mine from circus society who thought me how to fire spin also dues parasol spinning using a Japanese parasol. About hear is where I get my eureka moment over this shoot. Having the image I wanted to produce firmly fixed in my mind I was faced with several large problems to trouble shoot. The biggest is one of safety, How do you keep a paper parasol or the vintage kimono catching fire when being sprayed by sparks from burning wired wool being spun. As a side note if you ever do this sort of work make sure not to use synthetic fabric we had to make sure non of the clothing melts. Synthetic clothing is unsafe and must never be used near fire or heat. The other problem was that of lighting so we can see the model not just the sparks. Luckily finding a model was the easiest part of the equation. I went with Faye a beautiful model and confident fire performer. 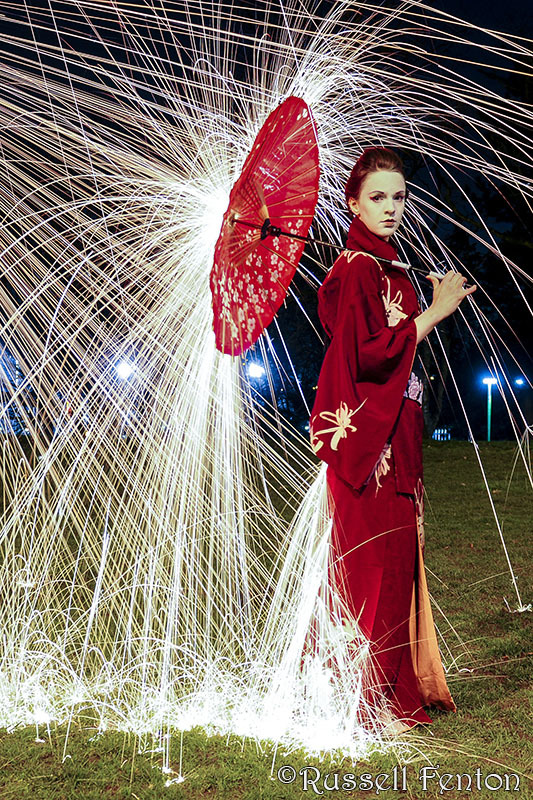 With my camera fixed to a tripod I had the model dressed in a vintage kimono and parasol treated so they would not catch fire. A set of lights in front of her and behind off camera a assistant in the way of another fire performer Rob spinning burning wire wool into the parasol from just off camera. Combining a long exposure to capture the trails and a set of strops to freeze the model and illuminate her this set of images were created. Just a not about safety. Shots like this should only be attempted if all participants are experienced with fire safety. We had all necessary precautions in place including trained medical personal. This entry was posted in Advise and Tips, Foxy, Photography. Bookmark the permalink. I'm Russell Fenton a freelance photograpther and welcome to my blog.